Both Muhlenberg basketball programs are riding win streaks which have put them on pace to make the Centennial Conference playoffs. Through games on Feb. 5 the women’s squad is in fifth place with an in-conference record of 9-6. 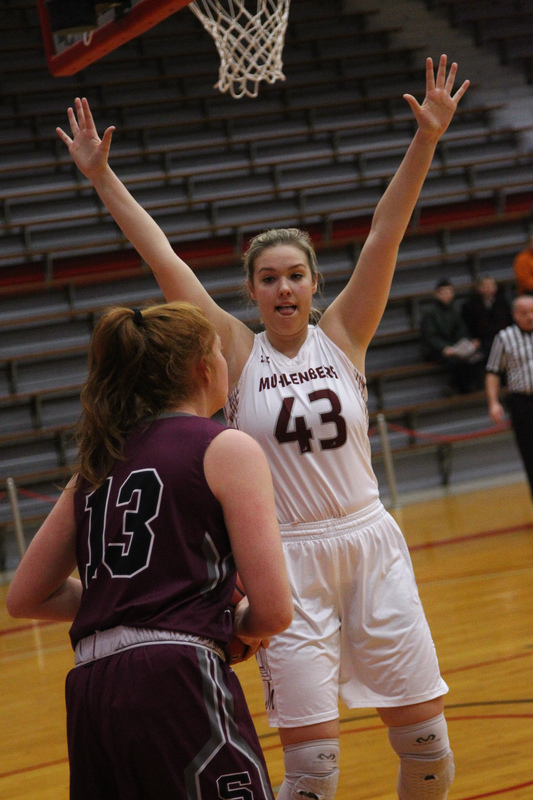 Muhlenberg holds a tiebreaker advantage over Ursinus – who ranks fourth – thanks to a win on Jan. 24 which swung the season series in favor of the Mules. The two teams are slated to meet once more in Collegeville, Pa. on Feb. 13 in a matchup that could have major implications on this season’s playoff picture. Two more dates to have circled on the calendar in thick red ink (or cardinal, if we are being appropriate), are Feb. 7 against Haverford and Feb. 16 against Franklin & Marshall. The results of both matchups will greatly impact the women’s odds of reaching the highest seed as possible (which we will explore below). They could also be the deciding factors on the program potentially missing out on a playoff spot. Regardless, a fifth place standing is unfamiliar territory for the Mules, and literally unchartered territory for any of the women on the current roster. The current student-athletes on the Mules haven’t experienced a regular season finish lower than second in the Centennial regular season. In fact, the program hasn’t dropped below third in the regular season standings since the 2013-14 season, and beyond that the Mules have made the CC playoffs every season since their 2004-05 campaign. Their most recent string of championships went from 2014-15 to 2016-17 when the team won three titles back to back to back. Not to say that a fifth place finish season would be a let down for the program. The playoffs are the playoffs. If success is had in the playoffs for any sports team, professional or collegiate, the memories will be about hoisting trophies rather than the seeding of the playoff spot the team achieved at the end of the regular season. Even so, there is still time to jump a spot or two in the standings. Time to predict the future. Well, maybe not predict as much as lay out the future and go over many of the possible scenarios. There is guaranteed to be enough talk of percentage point to make even the brightest Muhlenberg statistic major’s head spin. As of now, for the women, making the playoffs – which requires a top five finish in the Conference – is more likely to occur than not. Franklin & Marshall is currently in sixth, and they would have to leapfrog Muhlenberg to make the playoffs (that is why you circled Feb. 16 in cardinal ink on your calendar). A fourth place finish is probable (especially thanks to that tiebreaker over Ursinus mentioned earlier). A third place finish is possible (The Mules do play Haverford [cardinal ink! ], the current team in third place. A win would capture yet another season series tiebreaker against the Fords, since Muhlenberg already beat them earlier this season). And a second or first place finish is unlikely as the women dropped matchups against Johns Hopkins and Gettysburg already this season and would have to make up at least three games on each team. But a realistic ceiling of a place finish is perfectly acceptable. In the 2011-12 season the Mules finished third at the end of the regular season and won the Centennial Conference Championship, advancing to the NCAA regional tournament. This is a team that has shown the capability to get hot for a stretch of games too. The women enjoyed a nine game win streak to begin the season and are had another four game win streak snapped on Feb. 5 against Dickinson. “Our defense has been solid and has been able to force more turnovers. Our offense has become more efficient and we are shooting at a higher percentage,” said Hamilton. On to men. Currently the team is 8-6 in conference which slots them in fourth. They have four games remaining that can influence their playoff chances. Their two most impressive wins have come against defending conference champions Johns Hopkins. Although the two wins don’t give the Mules any immediate tie breaking advantage, they have obviously put themselves in better position by winning those games while sending a message to the rest of their conference that their defense and youth is legit. The last time the men’s program made the playoffs was when they finished fifth in the conference during the 2013-14 season. That was the last season of a four year run where the Mules made the playoffs each year, reaching the Conference Championship game in 2011-2012. 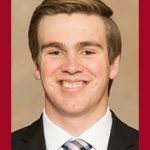 The men’s team is already young, starting four freshman and a sophomore against Johns Hopkins on Feb. 2, but earning a playoff berth would be new to all members of the program, and certainly an experience Hughes strives for in his final season. “We have a lot of young guys but they have been playing serious minutes all year, we are not a typical young team. When the moment comes I know guys will be ready to perform,” said Hughes in total confidence of his teammates. Get out the cardinal Sharpie markers out again. Mark Feb. 9 and Feb 13. Those two dates pit ‘Berg against Franklin & Marshall and Ursinus, respectively. The scenarios for each are simple. Franklin & Marshall is in sixth, hoping for a late season collapse from either the Mules or Dickinson. Ursinus is in a three way tie for first. Over the remaining two weeks of the season the conglomeration of teams atop the Centennial will surely break up, but because of their leads over the next closest teams in the standings (the Mules and Dickinson) it is likely they will remain in the top three spots. Keep in mind, like the women’s playoff scenarios, the men’s tournament also includes the top five teams in the conference regular season standings. A fourth seed vs. fifth seed “play-in” game? Yes. You read correctly. And the worst part is, the same holds true for the women’s bracket too. I have held this back because for the sake of our health it is best that the somewhat confusing system is only explained once. Didn’t red flags go off when it was stated that the ugly, prime number of five teams get into the playoffs? Thus, a special kind of bracket must be made. In turn, a first round of the CC playoffs showcases the fourth seed hosting the fifth seed. The winner plays the top regular season finisher in a traditional, four team semi final game. The two semi final winners play in the final and a champion is crowned. Not too bad, right? Anyway, time for the crystal ball again. Making a top five spot? Much like the women’s team, the men are more likely than not to finish within the threshold to secure a playoff spot. Even if they only go 2-2 throughout their remaining four (which is likely, being that they play Haverford and Gettysburg who both are in the bottom three of the conference) Franklin & Marshall would need to go 4-0 in their last four games which are all against teams in the top five standing positions. 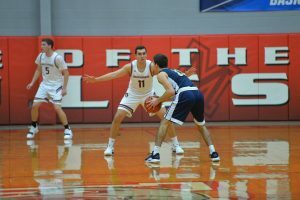 Finishing fourth is the most realistic place for the Mules to finish out their season when taking their own, and their opponents, schedule into consideration. Muhlenberg jumping to a top three spot is unlikely, even if they win out. The top of the conference is simply too clogged at 11-3. The only team the Mules hold a tiebreaker over is Johns Hopkins, so Muhlenberg would either have to go 3-1 or 4-0 (quite possible) but Hopkins would have go 0-4 or 1-3 (not as likely) for the Mules to break into a third seed. So, two programs likely to make the playoffs this winter? Absolutely. Guaranteed? Absolutely not. However, the fate is in these two team’s collective hands, and if they take care of their business both will have the opportunity to be cutting down the nets after a Centennial Conference Championship final.